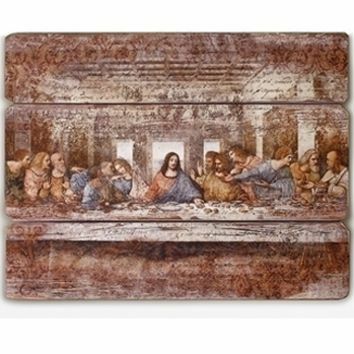 This stunning wall plaque, appearing to be crafted of joined pieces of wood, is a beautiful rendition of Da Vinci’s The Last Supper. The ruble distressed look gives it a vintage atmosphere while complementing its delicate shades of color. Such lovely visual appeal will be a welcome touch to any home.